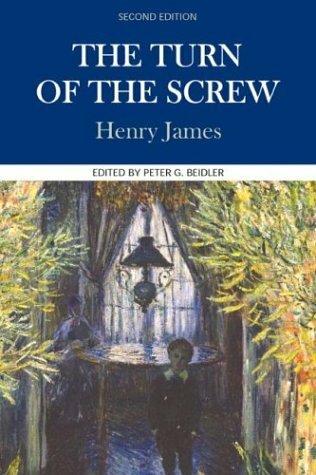 I first started to read The Turn of the Screw by Henry James a few years ago soon after I bought it. I stopped reading, mainly, I think, because it seemed so slow to get going with long, convoluted sentences that seem to drag the story down. So, it was with low expectations that I began once more to read it. I was surprised. This time the story didn’t drag, the sentence structure didn’t bother me and I became engrossed in the tale. It’s an ideal book for the RIP Challenge. But is it a ghost story or a psychological study? Either way there are creepy, disturbing things going on. It’s a story within a story, told as a ghost story to a group of people as they sit gathered round a fire in an old house. It tells of two children and their governess. She has been employed by their uncle who wants nothing to do with them. Their previous governess had died under mysterious circumstances (was it in childbirth?). The older child, Miles, was away at school and soon after the new governess arrives Miles returns home, expelled from school for some terrible unexplained offence. The children seem to the governess to be beautiful, little angels, but are they as innocent as they seem? And can they see the ghosts or not? Is the governess imagining them, peering in menacingly through the windows, standing silently and staring from the top of a tower, or gazing intently across a lake. Are they the ghosts of Miss Jessel, the previous governess and Peter Quint, also a previous employer? What relationship did they have with the children? Do they still have a hold over the children? These questions ever never fully answered and the governess, aided (or not?) by the housekeeper, Mrs Grose, becomes increasingly unhinged by all the events. I think it’s all the better for the ambiguity. The story is dark and melodramatic, about good and evil and with hints of sexual relations, reflecting the Victorian society of the time. The Turn of the Screw is based on a ghost story told to James by the Archbishop of Canterbury, Edward White Benson. It was first published in 12 instalments in Collier’s Weekly, a popular, illustrated New York magazine in 1898. By that time his wrist was too painful to actually write the story and he dictated it to his secretary, William MacAlpine, who typed as James spoke. My copy of the book is in the Case Studies in Contemporary Criticism series, edited by Peter G Beidler. It contains not just the text, but critical essays from four contemporary critical perspectives, plus explanations of the biographical, historical and cultural contexts. I haven’t yet read much of the additional material as I wanted to see what I made of it myself. Just scanning the essays I think they show the widely different interpretations and controversies this book has aroused and should prove very interesting reading. All I remember about it is being disturbed by the ambiguity–but that stayed with me over the decades since I read it. It’s odd how a book will affect a reader differently at different times. That’s happened to me as well. I’m reading Jane Eyre right now and enjoying it, but I had given up on it years ago. Haven’t ever read Turn of the Screw; I saw a dramatization of it once and thought I would like the book. This sounds like a wonderful October read, although October is flying by so fast it might end up as a Christmas read–not quite as appropriate. Thanks for stopping by my blog. I did read Morgan’s Run. It was great. I love the way McCullough draws her characters. The stories can have a slow build but then I’m completely immersed. So tempting. And I´m sure it would be the perfect pick for Halloween. Candle light and The Turn of the Screw….